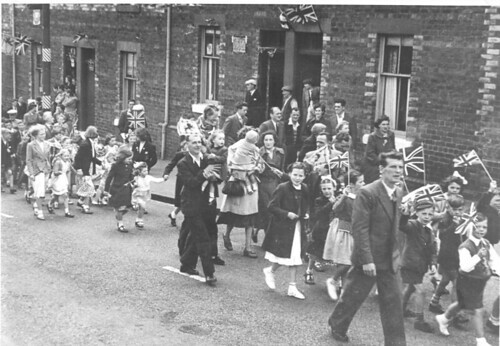 The above photo was taken in Gartcosh (village near Glasgow that I hail from) in 1953 onthe Queen’s coronation day. The gentleman at the front right of the photo is my grandfather (A.K.A. Gags/Gaga) and the two wee girls behind him are my mum and my aunt. Fantastic! Old photographs make me swoon. What a lovely photo! How lucky you are to have it. The children all look so innocent. Different is very good. Great little parade and a stunning photo. I love it, too. You can think a long time about what a day that must have been for them. What a lovely photo Wendy, I love all the little girls in their short socks and ribbons. My mum recently sent me a photo of them with dad’s family in 1968. It’s the year my brother was born, although I wasn’t around yet. And it’s lovely to see all the family, my dad’s amazing hair and mum in her funky 60s outfit. Great photo to be able to look back at, especially when it has relatives in it. loved your photo to-day. I’m from Scotland but have lived in the States for many years. I’m a wee bit older than your Mum but the reason I’m writing is that my children, born in Scotland called my Mum ,Gaga, I once read that Monica Dickens, the writer’s grandchildren called her that too. My son,who now lives in California,told me that he likes your website too. We are originally from Glasgow. Thank you, Wendy for all the nice recipes. I don’t eat meat and I have to say, I enjoy when you have a vegetarian type dish. My husband loves the sausages and onion gravy. That’s his favourite meal, right now. Thank you again,Wendy. Thanks for the great photo. Mary. Hi wendy, love the photo, also love your recipes…. I made your ‘golden curry’ tonight, and added some tofu because it was on its sell by, it worked fine. Also made your festive carrot cake for my friends birthday cake, it was amazing and impressive, thankyou! Also inspired to take some photos, yours are great. Heather – I’ve heard stories about my aunt at that age. Not so innocent – a real tearaway! Johanna – I wonder that too. Suspect most folk would steal their laptop from a burning building now. Kathyrn – I’ve seen photos from that era too and am always devasted my mum didn’t keep the dresses! Wanda – I know. That street doesn’t even exist anymore. James B – Isn’t it?